It's location is a haven to sailors, artists and visitors and footsteps away from National Trust heath and woodlands with stunning river walks. Living in the peace and tranquillity in this location you can view the seasonal coming and goings of the river, birds and wildlife on your doorstep. It is also only a short walk to a famous waterside pub and restaurant. This riverside home has been superbly converted from a steel Thames lighter and is divided between two floors. It has a well appointed large open plan living with log burner, kitchen dining area and cloakroom on the top deck with a separate sundeck and boat mooring to the stern. Below, in the stylishly fitted lower deck, she has been converted to offer 4 bedrooms, 2 bathrooms with one en-suite, as well as a utility room, workshop and office. She has oil fired central heating throughout. Water, electricity and telephone services are connected. Council tax is paid at Band 'A' rate and is currently c£900 pa. This Houseboat offers the ideal accommodation for someone who is looking to live near to the water and nature in comfort and style. Alternatively she would make an ideal weekend cottage or investment opportunity as a holiday let. These houseboats rarely come up for sale in this well known community and the opportunity to purchase should not be missed. 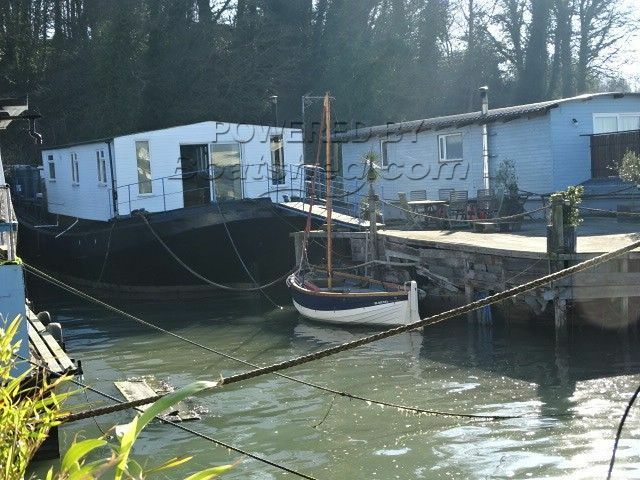 This Houseboat Conversion has been personally photographed and viewed by Nicholas Crook of Boatshed Suffolk. Click here for contact details.